So, it's that time of year where we all need to take extra care of our skin. For me, Winter is the worst time of year for my skin because 1. It gets super dry and 2. My skin is super sensitive. I call winter 'spot season' simply because its the only time of year that I have visible spots on my skin (highly annoying). I also get this major back problem where I develop loads of spots on my back known as acne, and have them throughout the whole period of winter. Anyway I went to Superdrug yesterday and bagged myself some goodies, I actually went in for some palmers cocoa butter body cream and came out with everything but the cream (darn it). 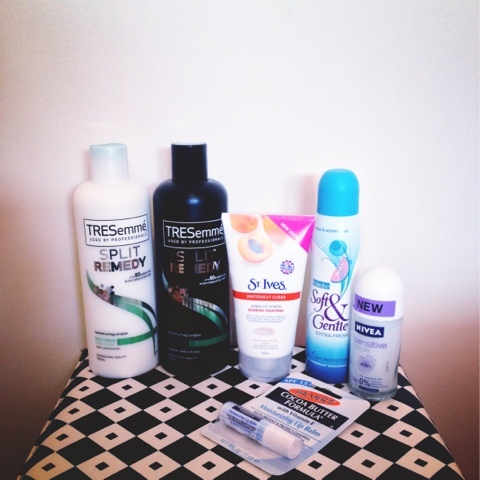 Also I thought I'd get myself some tresemme split remedy products for the harsh weather we're facing. I also bagged some St. Ives naturally clear apricot scrub. Now, this product has always been one of my faves and is so necessary this winter. What are your winter faves/essentials? I'd love to hear of some of the fab products you guys use!